Protein Hydrolysates are defined as the highly purified form of proteins which contains peptides, oligopeptides, and amino acids that are being pressed by partial or complete hydrolysis. Due to the presence of a highly purified form of proteins, protein hydrolysates enable rapid absorption of amino acids by the muscle cells, thus maximizing the nutrient delivery to the body. As a functional ingredient, protein hydrolysates are increasingly consumed in infant nutrition, food & beverages, clinical nutrition, sports nutrition & dietary supplements, cosmetics & personal care, and others. Owing to its versatile application in various industries, the global protein hydrolysates market is anticipated to experience positive growth during the forecast period. Regular consumption of proteins is often considered as vital for growth and development of muscle cells, as protein helps in building up the new cells and fixing damaged tissues in the body. Owing to this reason, health-conscious consumers are showing increasing interests towards protein ingredients over the years. Protein ingredients such as protein hydrolysates have thriving demand among fitness enthusiasts and other consumers to develop their physique. Milk protein hydrolysates such as casein and whey are well known for enhancing muscle growth and development due to the presence of an adequate concentration of highly purified proteins. Whey and casein protein hydrolysates also have functional benefits such as high rate of solubility in comparison with the other protein ingredients which enabled its application in the nutritional and supplement powders that supplies all the nine essential amino acids. Unlike other nutraceutical protein supplement, casein-derived protein hydrolysates gradually discharge amino acids into the body to, making them perfect evening time supplements. Owing to these reasons, the global protein hydrolysates market is anticipated to remain positive throughout the forecast period. Protein hydrolysates are derived from relatively common raw materials such as milk, soybean, and eggs. The easy availability of such materials in conjunction with high demand has resulted in the emergence and presence of a significantly high number of domestic or small-scale protein hydrolysates as an ingredient or end-product manufacturers across the world. Online channel offers substantial benefits to such diminutive manufacturers who might face several entry level hurdles such as high marketing costs. Online channel forms a platform to significantly reduce the distribution costs and in seeking consumer attention more efficiently. The increasing use of modern technology and social networking sites is propelling the use of online shopping of infant formula and sport nutrition products in developed as well as developing countries. In developed economies, the sales of infant formula and dietary supplements through online has significantly increased in comparison with offline sales. Working mothers are the target consumer base for E-commerce marketers who offer protein hydrolysates based infant formulas. The sale of nutrition products on online shopping sites provides customers with a convenient option to purchase and choose from a wide variety of nutrition products in a relatively short span of time as compared to visiting a physical store. Many online stores also offer specialty and clean label products such as protein hydrolysates that are not easily available in regular offline stores, which is embracing the growth of global protein hydrolysates market in recent years. Consumers in developed countries such as the U.S, Canada, U.K, and others are progressively focusing on product labels to know the nutritional value and volume of ingredients being used. in packaged food products. This has led to manufacturers using protein ingredients such as protein hydrolysates as it is both nutritious and low in fat content. The presence of one or more nutrients such as proteins, vitamins, and others appeals to a wide audience and provides ample marketing scope to manufacturers. Protein hydrolysates are being increasingly perceived as healthy products that are a source of various amino acids that are not produced in the human body or are concentrated in muscle. Whey protein hydrolysates are considered a complete protein diet, i.e. it contains all the nine essential amino acids. Egg protein hydrolysates are considered a viable and safe source of choline, selenium, vitamin B12, vitamin D, riboflavin, and phosphorus. Soy protein hydrolysates contain almost twice the amount of protein as that of other legumes. As a nutrition-dense ingredient, protein hydrolysates has been the consumer’s choice when it comes for dietary supplements in the developed economies. An important aspect of infant formula is gaining attention all over the world. These formulae are prescribed to the toddlers and infants suffering from inborn complications such as lactose intolerance as an alternative to mother's milk. However, nearly 30% of infants fed with conventional infant formulae suffer from severe gastrointestinal discomforts such as constipation and colic. Protein hydrolysates play an important role in terms of infant nutritional products without causing gastrointestinal difficulties, which is why protein hydrolysates find remunerative applications in fast-growing health and wellness sector as a vital ingredient in these products which are resulting in increased demand for protein hydrolysates in infant formula, clinical nutrition, etc. This, in turn, represents significant potential in terms of opportunity for manufacturers of protein hydrolysates to enter the untapped market. As a functional ingredient, protein hydrolysates are increasingly consumed in dietary supplements and sports nutrition, food and beverages, clinical nutrition, infant formulae, cosmetics, and personal care products, and others. Attributable to its adaptable application in different industries, the global protein hydrolysate market is anticipated remain positive during the period of forecast. The proposed market report of TMR on the global protein hydrolysates market evaluates opportunities in the current market and provides latest updates and insights corresponding to various segments involved in the global protein hydrolysates market over the forecast period 2018–2027. The report on the global protein hydrolysates market provides historical data of 2013, along with the estimated data for 2018, and forecast data up to 2027 in terms of value (US$ Mn) and volume (MT). The present study exhibits the trends and market dynamics of the protein hydrolysates market in five major regions - North America, Latin America, Europe, Asia Pacific, and the Middle East and Africa. The report also includes the study of the current issues with consumers and various future opportunities for the protein hydrolysates market. The report explores the global protein hydrolysates market for the period 2018–2027. The primary objective of the global protein hydrolysates market report is to provide insights into the key developments in the market that are consistently supporting to transform global businesses that are associated with the protein hydrolysates market. It is very important to consider that, in an ever-wavering economy, we provide the estimated (Y-o-Y) year-on-year growth rate in addition to the Compound Annual Growth Rate (CAGR) for the overall forecast, to better understand the analysis and evaluation of the global protein hydrolysates market, and to discover equitable opportunities. Yet another key feature of this report is that the estimation of the global protein hydrolysates market and the corresponding revenue forecast is carried out in terms of absolute dollar opportunity analysis. This is usually not prioritized while forecasting overall market numbers. Absolute dollar opportunity analysis is very essential in evaluating the degree of opportunity that a provider can observe to execute, as well as to contrast the potential resources from a sales perspective in the global protein hydrolysates market. The global protein hydrolysates market report starts with an elaborate executive summary, the market definition of various segmentations that are included, and their respective shares in the global protein hydrolysates market. The report further incorporates the major macroeconomic factors that have an effect on the growth of the protein hydrolysates market. 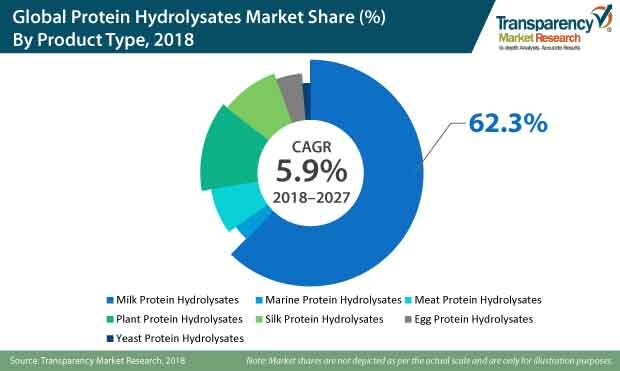 The report also highlights various market dynamics, which includes the drivers, restraints, opportunities, and trends in the global protein hydrolysates market. The report further underlines the study of present issues with industrial processing, and opportunities for the protein hydrolysates market. It also encompasses value chain analysis, which provides a structural view of overall profitability from the manufacturer to the end user in the protein hydrolysates market. In order to provide users with a clear view of the global protein hydrolysates market, we have exhibited a competitive analysis of key market players and their strategic expansions. The competitive dashboard presents a detailed comparison of protein hydrolysates manufacturers on valuable parameters such as key product offerings, total revenue, key developments, and key strategies. The study intensifies the global protein hydrolysates market attractiveness analysis by product type, source, form, end use, and region. To evaluate the overall market size of protein hydrolysates, the report considers various fundamental aspects based on secondary research. Furthermore, it emphasizes quantitative evaluation such as market share by product type, source, form, end use, and region, and other qualitative data from primary respondents, which have been consolidated to arrive at clear and accurate market estimations. The forecast provided in the protein hydrolysates market report concludes at the total revenue being generated, and the expected revenue contribution in the future by the global protein hydrolysates market. Detailed profiles of companies that manufacture protein hydrolysates are included in the report to analyze their developmental strategies, key product offerings, and recent developments, as they have a significant role in the global protein hydrolysates market. Major market players covered in the protein hydrolysates market report are Abbott Laboratories Koninklijke DSM N.V., Archer Daniels Midland Company, Tate & Lyle PLC, Nestle S.A., Arla Food Ingredients Group, Roquette Frères S.A., Glanbia Nutritionals, Inc., Cargill Inc., FrieslandCampina DMV B.V., Kerry Group Plc., Fonterra Co-Operative Group Ltd., Carberry Group Ltd., A.Costantino & C. S.P.A, Armor Proteines, Davisco Foods International Inc., Hilmar Ingredients and others.